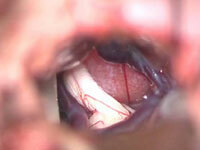 We provide microvascular decompression for trigeminal neuralgia in some rare conditions. 1. Trigeminal neuralgia caused by larger arteries, such as vertebral or basilar artery. Some additional technique is required to treat with this condition, as transposition of the culprit artery is sometimes difficult. 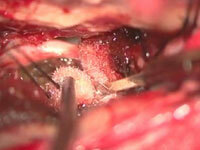 The nerve is vend by the vertebral artery The nerve recovered to be straight after decompression. 2. Trigeminal neuralgia caused by vein. 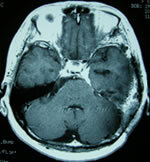 As for this condition, it is generally difficult to get precise diagnosis by non-contrast MRI. 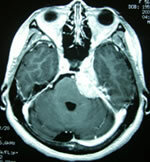 Contrast enhanced MRI must be necessary to make a precise diagnosis. As this type of trigeminal neuralgia carries higher risk of recurrence, cutting the vein is preferable rather than transposition of the veins. Artery (red) has no contact with the trigeminal nerve (yellow), while only vein (blue) has contact on the nerve. The vein (arrow head) contact with the trigeminal nerve (arrow). 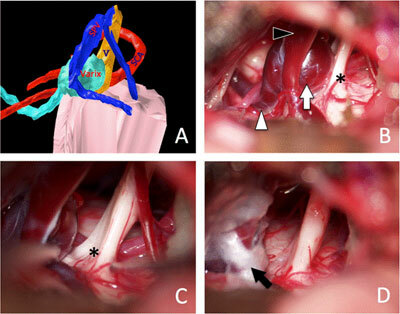 The insertion is the pre-OP 3D image, represents the same picture with the real operative findings. 3. Trigeminal neuralgia caused by arachnoid adhesion. 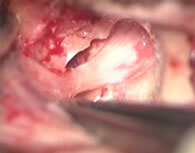 This type of trigeminal neuralgia is difficult to diagnose only by MRI. Careful history taking is only the way to establish the diagnosis. 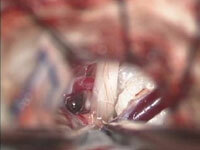 In this case, cutting the arachnoid membrane attaching on the nerve relieved the pain. 4. Trigeminal neuralgia caused by tumors. 5〜10% among trigeminal neuralgia may be caused by brain tumors, such as meningioma, shwannoma and epidermoid. The symptom will be cured by removing the tumors around the nerve. Appropriate removal may differ in case by case. Gamma Knife is applied to control the pain. 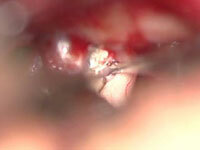 Partial removal around the trigeminal nerve lead pain free. Tumor was totally removed, the patient got pain free. Pain free after tumor removal. Pain free after releasing the compression. Pain free after partial removal of the contact on the nerve. Pain free after removal of the tumor. Inadequate surgery might cause recurrence of the symptom. 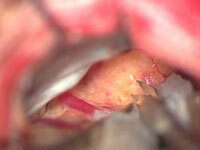 Foreign materials inserted between the nerve and artery highly causes the recurrence of trigeminal neuralgia. Removal of the material is required to treat this condition, which usually meticulous dissection from the nerve is required. 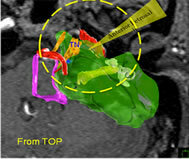 Former inserted Teflon adhesion between the nerve and artery was the cause of Trigeminal neuralgia. Too much Ivaron caused the Trigeminal neuralgia. The symptom subsided after removal. 6. 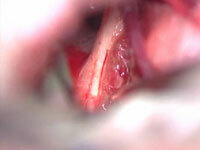 Trigeminal neuralgia caused by anomaly or malformations. Anomaly of the cranium, venous angioma and persistent trigeminal artery may cause trigeminal neuralgia. Precise diagnosis and adequate strategy is important for curative surgery. Translucent view of the vein reveals the contact of the arteries on the nerve. Two arteries and two veins are found to have contact with the nerve on the both side. The nerve is pinched by two large veins. Two pair of arteries and veins were culprit in this case. Trigeminal neuralgia caused by Varix. C, D: Transposition of the Varix relieved the pain. Normal approach behind the ear is difficult to operate in this case. 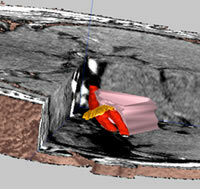 Approach through temporal side enabled to release the compression of the bone. Multiple arteries were responsible in this case.